Western University has recognized The Centre for Research & Education on Violence Against Women & Children (CREVAWC) for its groundbreaking research and 25-year partnership with the community. CREVAWC strives to prevent violence against women and children and vulnerable adults through innovation, collaborative relationships with community partners and gender equality. “We have made tremendous progress in the field but our work is not done – in fact we appear to be at a tipping point in public and professional awareness that will require even more demanding research,” said Peter Jaffe, Academic Director of the Centre and Professor in the Faculty of Education. The Centre produces resources, such as reports, learning briefs, newsletters, web-based resources, videos and online training that is used by local, provincial, national and global communities. Also, Centre staff and graduate students provide expertise on advisory councils and government review panels, including being expert witnesses in court. The Centre began in 1992 – three years after 14 young women were murdered at École Polytechnique in Montreal. The killings, which shocked the country, led the federal government to establish five Centres of Excellence to promote applied research on violence against women and children across Canada. For the past 25 years, CREVAWC has partnered with The London Coordinating Committee to End Woman Abuse, Fanshawe College and Western University. Since 2014, the Centre has had over two dozen grants and contracts totaling over $5.6 million dollars. 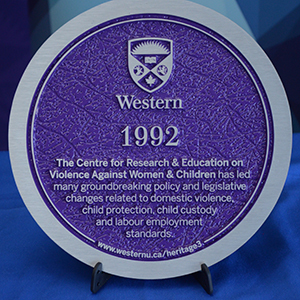 To encourage awareness about Western’s research, Research Western has created a series of digitally linked heritage plaques to celebrate significant research-related moments in the university’s history. The plaques also encourage the campus community and its visitors to learn how these contributions have benefited the social, financial, cultural and medical well-being of citizens in Canada and around the world. As part of the selection process, faculty, staff and students at Western voted for two plaques: one from a science, technology, engineering and mathematics discipline and one from a social science, arts and humanities-based faculty. Read more about CREVAWC’s work. Read more about Western’s research heritage plaque project.